The coat o airms o Georgie wis adoptit on 1 October 2004. It is partially based on the medieval airms o the Georgian ryal hoose o Bagrationi. It haes twa lions rampant as supporters o the shield, which is surmountit wi the ryal croun o Georgie, aw o them Or (gowd). The shield itsel is Gules (red), wi an image o Saunt George, ridin a horse tramplin upon a crawlin serpent, whose heid is pierced bi the saunt's spear, aw o them Argent (white). The motto belaw the shield reads as : "Strength is in Unity" (Dzala Ertobashia, written in the Mkhedruli script o the Georgian alphabet, ძალა ერთობაშია). This coat o airms wis in uise bi the Democratic Republic o Georgie throughoot its existence in 1918-1921. Tho the uise o Saunt George as Georgie's patron saunt wis bi then a lang tradeetion, thare wur some discussions aboot ither possibilities, the major ane bein Amiran, as the seembol o Georgie's fecht for freedom frae the Roushie Empire. Housomeivver, a decision wis then made in favor o saunt George. Restored in 1991, this coat o airms wis replaced bi the current ane in 2004. Or, wi an image o Saunt George Martyr the Victorious in complete armour Azur wi a cross on his breast, wi a flyin cloak Gules, ridin a horse Sable in full gallop, the latter covered wi a horse cloth Gules, fringed Or, tramplin upon a crawlin serpent Vert, winged Sable, eyed an tongued Gules, whose heid is pierced bi the saunt's spear Gules. Coats o airms wur maistly those o the Bagrationi, who claimed tae hae Keeng David amang thair ancestors, an includit such elements as Keeng David's lyra an sling, or the Holy Tunic. The Georgian Coat o Airms in: Georgian History bi Giorgi Gabeskiria. 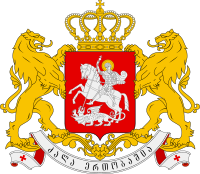 Wikimedia Commons haes media relatit tae Coats of arms of Georgia. This page wis last eeditit on 12 Julie 2018, at 19:10.